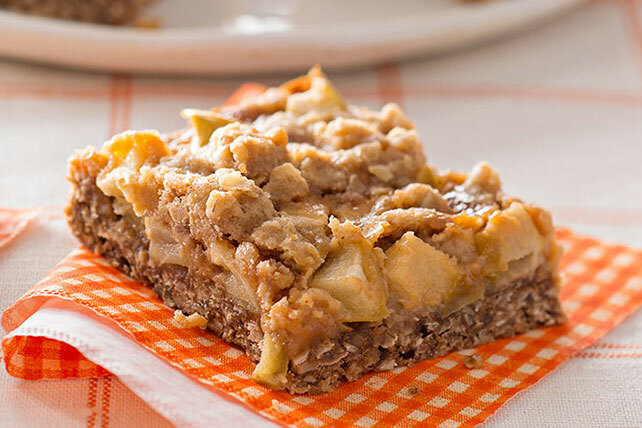 This easy-to-make, easy-to-eat caramel apple crisp bar recipe is the epitome of spicy, caramel-kissed goodness. Line 13x9-inch pan with foil, with ends of foil extending over sides; spray with cooking spray. Mix oats, 1 cup flour, baking soda and spices until blended. Beat butter and sugar in large bowl with mixer until light and fluffy. Gradually beat in flour mixture until blended. Reserve 1 cup oat mixture; press remaining onto bottom of prepared pan. Bake 15 min. Meanwhile, microwave caramels and milk in microwaveable bowl on HIGH 2 min. or until caramels are completely melted and mixture is well blended, stirring every 30 sec. Stir in remaining flour. Sprinkle apples over crust; drizzle with caramel sauce. Crumble remaining oat mixture over caramel sauce. This scrumptious flavor combination in these dessert bars makes them the perfect treat to enjoy at your next special occasion. Prepare using 1 Granny Smith and 1 Gala or Honeycrisp apple. Prepare using 1 pkg. (11 oz.) KRAFT Caramel Bits.